← What is a shooting star? To celebrate the official launch of Lie Back, Look Up, I am offering a free printable and a giveaway! This is a website that I’ve been dreaming about for awhile, and I’m so very excited to finally get it off the ground. I hope you all have as much fun visiting here as I do sharing my ideas. 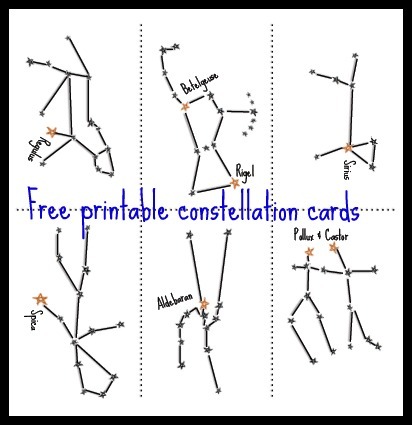 As a “thank you” for helping me launch, I invite you to download these free constellation cards. These can be printed and enjoyed over and over again with your family. They will be available free-of-charge throughout the month of July. Three lucky winners will be receiving a free planisphere. 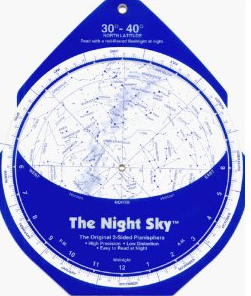 A planisphere, also known as a star wheel, is a great basic tool to have for stargazing. You just have to spin the disk to match up the time and date that you are stargazing, and it will show you which constellations you should see in the night sky. To be entered into the random drawing, just leave a comment with your email address (in the “email” field in the comment form). For an extra entry, share this post via Facebook, Twitter, Google+ or Pinterest (you can use one of the buttons at the bottom of this post), and let me know that you did so in a separate comment. For a third entry, subscribe to this blog and let me know in the comments as well. If you win, I’ll email you to ask for your latitude so I can make sure to get you the correct planisphere for your location. Comments will close on this post on Friday, July 20 at 1 PM EST. Winners will be announced on Monday, July 23. Good luck in the planisphere giveaway, enjoy the cards and don’t forget to Lie Back, Look Up! This entry was posted in Family Activities. Bookmark the permalink. I completely freaked out when I saw “The happiest Mom” blog mentioning this. I am SO excited!!!!!! I always want to learn things but it’s hard! I hope I win!!!! thanks for having such a great site! Hope it goes well for you! AND I shared it on my fb page! thanks for such a great “different” blog! This looks super cool! Please enter me in the contest. Love this! Such a great thing to do with your kids! Will share on my Facebook page too! What a great WellRoundedKid activity! Congrats on the new blog. Just yesterday I went looking for a site that would help me interpret what I saw in the sky in the morning (I swore it was 3 planets that I could see!) – turns out it was two, plus a really bright star grouping and another bright star. It amazes me. I grew up in MA, in a relatively small town, but not far enough away from the bright lights and big city. So, when I moved here, to FL, the stars felt abundant and brighter. It would be cool to be able to identify what I am seeing. I sure do love this site! That sounds like a very cool place with a lot of neat night sky events! Thanks — this looks really great. Good luck! I can’t wait to try to find some of these constellations with my son, I have never been very good at it – but I’m going to give it another try! This site is such an inspiration. I am definitely planning a family experience. I hope it ends up being manageable with your advice. Congratulations! I have the kids separate by seasons and circumpolar (ones we see all year) they love it.